The cylinder is an essential component of the Snowpulse Avalanche Airbag. The Snowpulse Cylinders (207 bars or 300 bars) contain pressurized dry air. 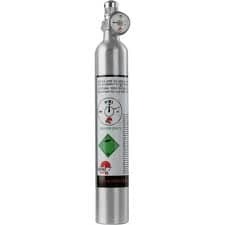 The air pressure can be controlled thanks to a pressure gauge, these cylinders are refillable. New: Easy and quick to install inside the deployment mechanism. The airbag system uses cartridges filled with nitrogen or air. The working pressure of the cartridges must comply with the pressure specified for the given temperature. Incorrect pressures can damage the system or negatively impact safety. The pressure must be checked prior to each and every use (see Quick Start Manual). The cartridges, when filled, come under the rules governing the transport of non-toxic non-flammable gases on land and in the air. The rules differentiate between the 300 bar and 207 bar cartridges. Please note those that apply to your type of cartridge. When transporting the airbag system, the cartridge must be kept separate to avoid any inadvertant triggering. Always store and carry the cartridge in its original packaging and with the protective cap screwed firmly in place. The IATA (International Air Transport Association) prohibits the carriage of the 207 bar cartridge. The only territory where it is allowed is Canada (domestic flights). Despite its approval by the IATA, individual carriers may refuse to carry a 300 bar cartridge. We therefore advise users intending to travel with their avalanche backpack to contact their carrier no less than two weeks before departure. If possible, users should clarify the situation prior to booking their flights. It is also a good idea to print out the relevant IATA table and the data sheet relating to your cartridge to show any sceptical check-in staff. Both documents are available on the Webpage : FAQ / transport. You must inform the postal/shipping company of the presence of a filled cartridge in the consignment. The information required by the shipper may be found on your cartridge’s data sheet.